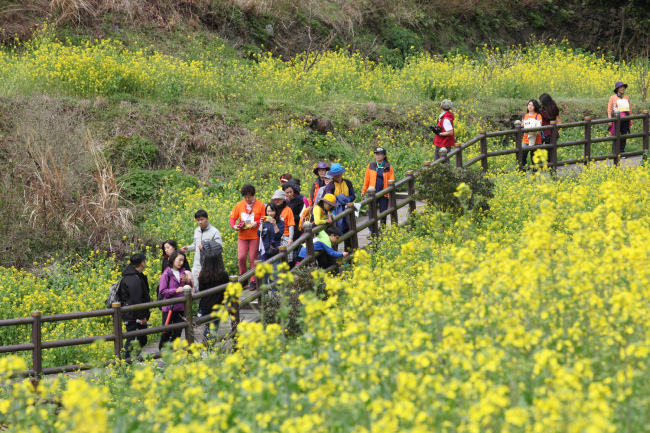 Seogwipo, on the south coast of Jeju Island, will host an annual walking festival that takes place alongside its famous canola flower fields. 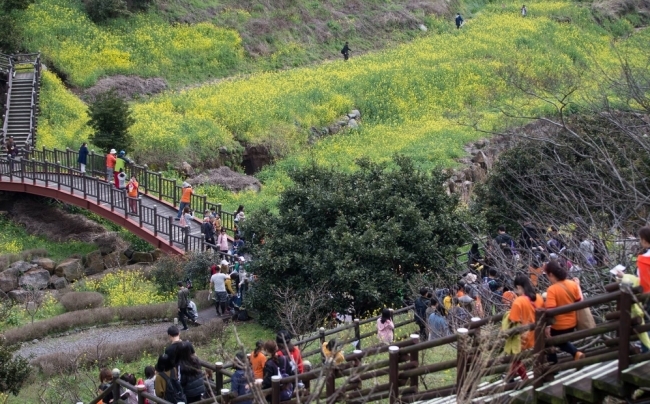 According to Seogwipo Tourism Council, which organizes the event, the 21st Seogwipo Yuchae (Canola) Flower International Walking Festival will be held March 23-24 across the seaside city. It is co-hosted by Seogwipo metropolitan government and Korea Athletic Promotion Association. As Jeju is one of the biggest tourism spots in the country, hundreds of participants from outside the country are to participate. This includes a group of 100 people that will visit from Dalian, China. “The festival has become an adult, so to speak As such, we have prepared the event more thoroughly,” said Yang Gwang-sun of the tourism council’s organizing committee. Day one of the festival will kick off at the Jeju World Cup Stadium, and circle around what is also section seven of “Jeje Olle Trail” to finish at the stadium. Participants can choose between five, 10 or 20 kilometer courses. The course for the second day will also commence and conclude at the World Cup Stadium, but around a different course. Various street performances and events will be featured along the way. The participation fee is 10,000 won for adults while kids can go for free. Paying participants get a map of the course, a T-shirt, their own numbers, water and other beverages and a ticket for a lucky draw. The course is public, though, and simply walking along it is open to anyone. The festival is part of the “East Asia Flower Walking League” along with the city of Dalian and Kurume, Japan, which host their own walking festivals in spring. Last year‘s festival had 8,000 participants.